Next in the series of slightly deficient Masyu. Enjoy, nonetheless. This entry was posted in Puzzles and tagged easy, masyu, standard on 2014-02-23 by rob. 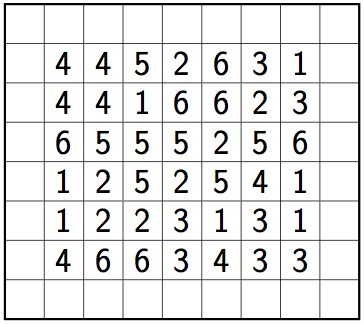 Rules Find the whole set of dominos with numbers 1 to 6 by dividing the grid into orthogonally connected areas with two digits each. This variation on the standard Domino puzzle featured on the Dutch round of last year’s WPC, there’s some more on Bram’s blog. There should be two quite different ways to get started on this one. 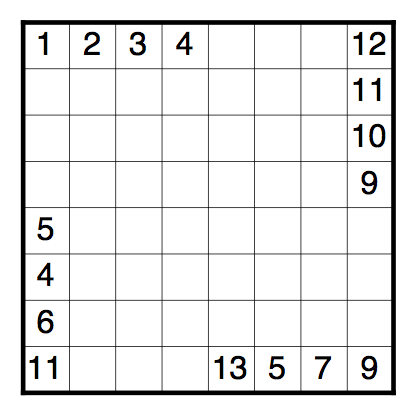 This entry was posted in Puzzles and tagged domino, domino extra, easy, variant on 2014-02-18 by rob. 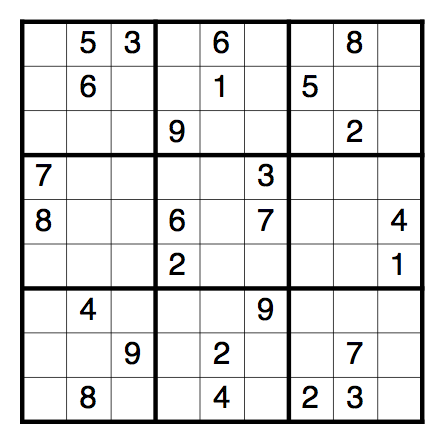 This entry was posted in Puzzles and tagged easy, standard, sudoku on 2014-02-14 by rob. Here’s a small Magic Labyrinth. Can you tell where the 4 doesn’t go? 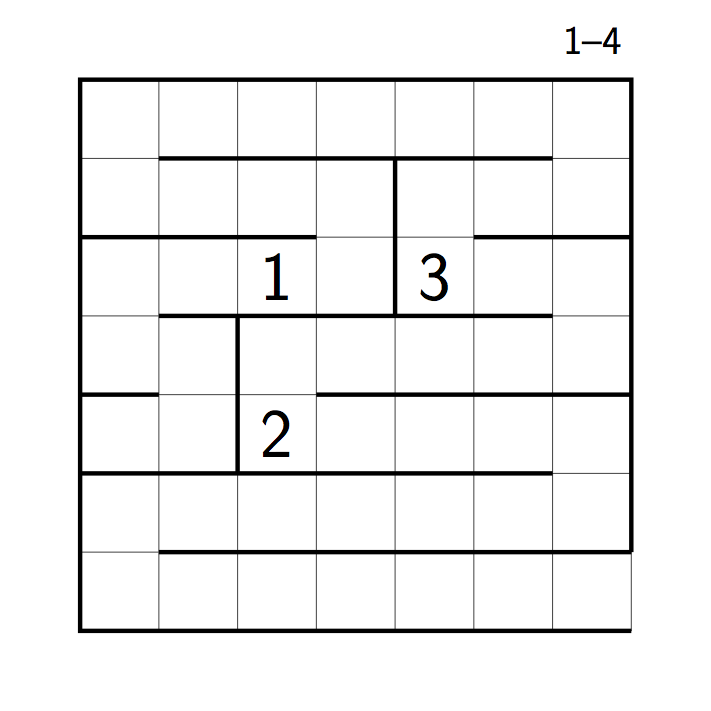 This entry was posted in Puzzles and tagged magic labyrinth, medium, standard on 2014-02-10 by rob. 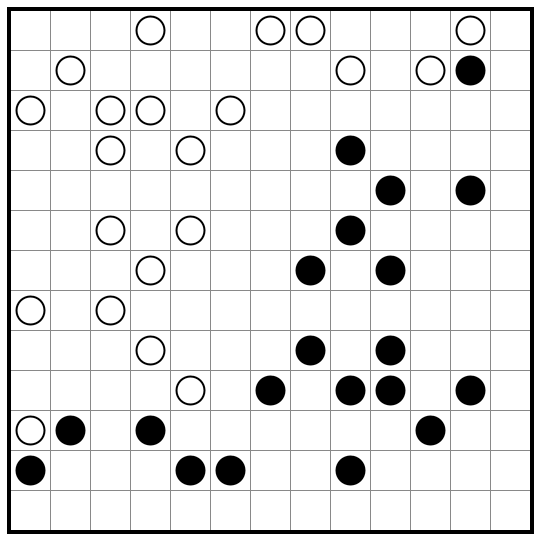 Here’s an older and easier LITS+ puzzle. 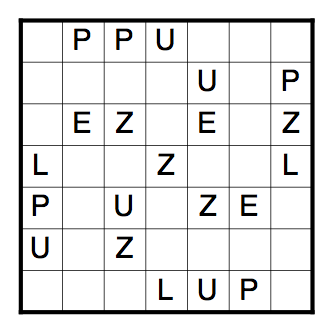 This entry was posted in Puzzles and tagged easy, lits, lits plus, variant on 2014-02-08 by rob.